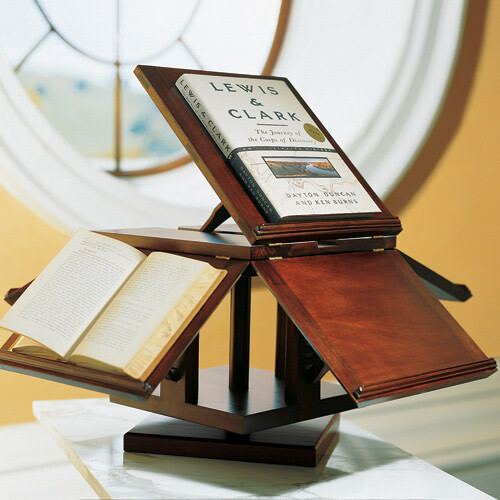 Thomas Jefferson devised this rotating bookstand so that he could easily refer to several publications at once – his version of an I-pad? Reproductions are available through the shop at Monticello. It’s commonly agreed that a house expresses its resident’s values and personality. Walk into a person’s home, and you’ll immediately know a lot about them; no need to open a single drawer or ask any questions. Still, some houses are more personal than others. And by this criteria, you could say that Thomas Jefferson’s Monticello never stopped talking. The third president of the United States was also the architect of his own well-known home in the hills of Virginia. (If you don’t know what it looks like, grab a nickel – that’s the garden facade on the back of the coin.) Jefferson built the house starting in 1768 and finishing in…well, when he died in 1826. Yes, like many of us who take on a home building or renovation project, Mr. Jefferson never quite finished it. Thomas Jefferson’s Monticello is high up the list of great houses of the world. But even though it is famously neoclassical in design, it’s also a quirky, extremely original home. Jefferson kept making changes to the building and grounds not to up its resale value, but to make it better suit his needs – and to try out the many ideas springing from his polymath mind. The house was "substantially completed" in 1782 – but that turned out to be only round one. The structure we see depicted on the nickel – with its well-proportioned dome – didn’t appear until nearly 20 years later. In the meantime, only two years after most of the original house was habitable, Jefferson was off to France for a five year stint as minister to that highly-cultured country. While there, he soaked up continental influences and came back with new ideas. In 1796, he demolished the entire second story of what he’d originally built, and reconfigured the interior and exterior substantially. The upper columned portico was gone, replaced by the first dome to be built on a residential structure in the US. North and South terraces and dependencies were built in 1801, further extending the building gracefully into the landscape in a way that many a modernist West Coast architect would admire. Monticello itself is a beautiful example of the timelessness of good architecture, and the underlying design principles that provide the foundation for buildings in various styles and fashions of architecture. The materials and technologies may change, but the fundamental need to provide shelter and beauty do not. In its own way, Jefferson’s Monticello reminds me of the famous modernist house Charles and Ray Eames built in 1949 and lived in all their lives. Both houses were the place of ongoing artistic, scientific and intellectual experiments. They were also where their owners displayed wide-ranging collections of stuff – art and archaeolgy and who knows what picked up in travels around the world. The entrance hall at Monticello is a veritable mini-museum of natural history and civilization, walls covered with paintings, antlers and artifacts brought back by Lewis and Clark. Some people’s houses continue to inspire even after the people have departed. Thank goodness for that.